Teaching “Spice it Up! Creative Cooking with Herbs and Spices ” as an organic garden to table workshop in my country kitchen. 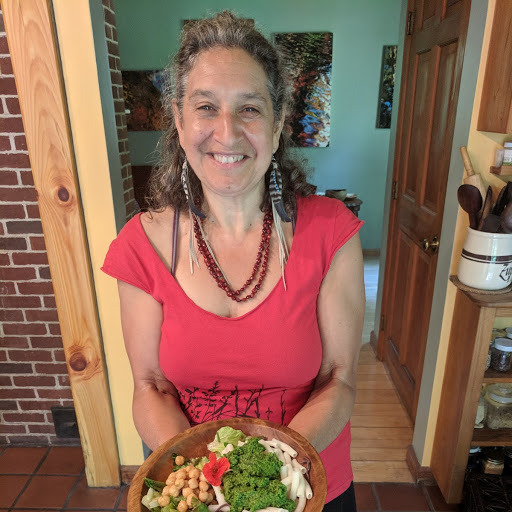 I am grateful for all that came out to enjoy this hands on vegetarian, cooking class. Here are some of the dishes we made during the weekend. 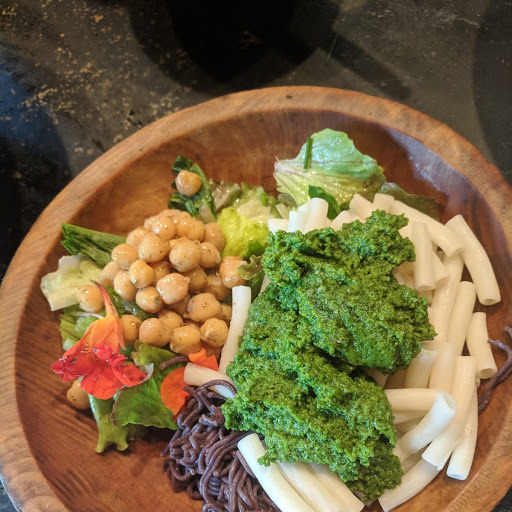 For lunch we made kale pesto with 2 different organic, gluten-free pastas: quinoa macaronis and forbidden rice ramen noodles. 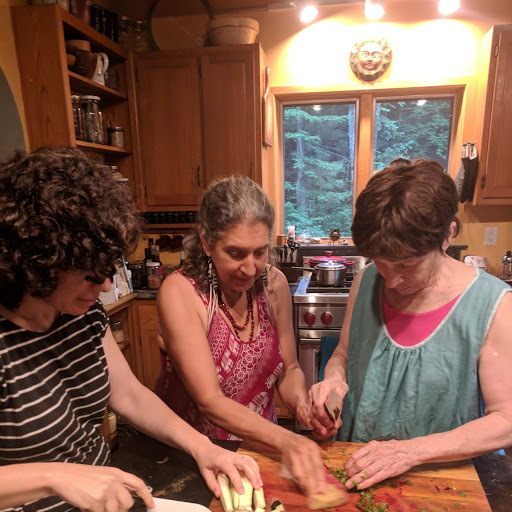 When on purpose, I added too much hemp oil, the participants learned how to correct seasonings and bring out the garlic (scape) flavor with a bit more sea salt and a few more garlic scapes and voila the flavors came together for a delicious thick topping for the pastas. Other ingredients used in the pesto: organic, local, grass raised artisan cheese, hemp seeds, infused lemon olive oil, and some water. Fresh anise hyssop, nasturtium flowers, my blueberry vanilla balsamic vinegar and a splash of clementine olive oil spiced up the salad. in the dinner class, we made a coconut curry lentil vegetable soup and I demonstrated how to dry roast mustard seeds; how to fry spices in ghee: mustard seeds, fennel seeds, cumin seeds, coriander seeds. Then we added those fried spices to rinsed red lentils, chopped onions, tossed in a couple of cinnamon sticks, dash of cayenne, and water. Simmered it while we made our Asian Slaw with arame (sea vegetable) Chinese cabbage, beets, hemp seeds, cilantro and ginger. Dressed it with toasted sesame oil ume vinegar, and yuzu vinegar. YUM! then when the lentils were soft and dissolved we added some fresh chopped zucchini, cilantro, fresh ground sea salt and black pepper to taste. Everyone got to decorate their meal with toasted black sesame seeds, and more hemp seeds. 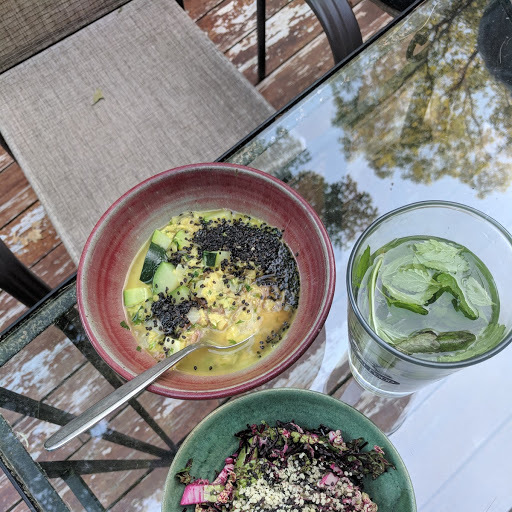 We happily drank some infused herbal water from garden fresh lemon balm, tulsi basil and mint, and enjoyed the meal outside overlooking the gardens. Special thanks to Lana Camiel, one of the participants of the Spice It UP! for the photos.